The United Kingdom could leave the European Union by 22 May if the British Parliament supports a customs union in Monday’s indicatives votes, officials in Brussels commented seeing this scenario as the most likely right now. British news portal The Guardian reports that on the evening of Monday, April 1, the British Parliament is to take part in a second round of indicative votes on a potential solution to the Brexit impasse. MPs are expected to vote again on several options that have already been voted down, with the cause of the impasse still being the inability of British legislators to support any option with a majority. The British Prime Minister’s deal, in which the political declaration does not tie both sides to negotiating a customs union, has been voted down three times – by 230, 149 and 58 votes. However, the writing into the deal of a customs union, lost by only eight votes when it was voted upon last week, along side seven other ways forward, with both the SNP and the Liberal Democrats abstaining. 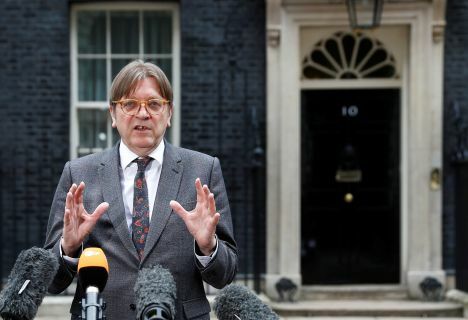 Guy Verhofstadt, the European parliament’s Brexit coordinator, told the Belgian radio station VRT: «There was almost a majority in favour of a customs union with the EU. What we expect is that a proposal could reach a majority around the customs union and then we are prepared, on the EU side, to renegotiate the declaration and to include that customs union therein».